A decision has been reached by the arbitrator in the dispute between COMSAT Corporation, now part of Lockheed-Martin Global Telecommunications, and Associated Universities, Inc. (AUI) regarding additional costs on the contract to design and construct the Robert C. Byrd Green Bank Telescope (GBT). 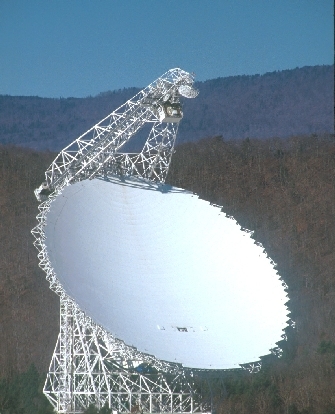 The GBT, in West Virginia, is the world's largest fully steerable radio telescope, the newest facility in the National Radio Astronomy Observatory's (NRAO) suite of astronomical instruments. The decision, released by the American Arbitration Association (AAA), calls for AUI, which operates the NRAO, to pay COMSAT $4.07 million over the fixed-price contract amount. The contract had standard provisions for disputes, which specify binding arbitration through the AAA for matters that could not be resolved in negotiation. The contract to design and construct the GBT had an agreed fixed price of $55 million, with work to begin on December 19, 1990 and to be completed by the end of 1994. The contract terms required the telescope to be designed and built to performance specifications, placing most of the performance risks associated with the project on the contractor. The telescope was accepted from the contractor on October 13, 2000, nearly six years later than the original contract delivery date. During the entire period of contract work the only agreed change in scope was a single change order for $150,000 executed in August of 1993. In 1998, COMSAT sought an additional payment of approximately $29 million above the contracted amount, alleging that AUI/NRAO had forced it to conduct unnecessary work on the telescope design and to build the telescope to an unreasonable life cycle (fatigue) specification. COMSAT also claimed that AUI/NRAO was obligated to pay the costs of accommodating what it claimed to be additional wind loads. COMSAT blamed these circumstances for its delay in completing the project on time and within the contract price. AUI/NRAO maintained that the COMSAT claims were without merit, noting that COMSAT was responsible for both designing and constructing the telescope to performance specifications. Furthermore, it was AUI/NRAO's position that any costs incurred by COMSAT beyond those anticipated at the signing of the contract were the result of COMSAT's own decisions and management of the project. AUI/NRAO filed its own claims against COMSAT for the costs to AUI/NRAO resulting from the delayed delivery and loss of use of the telescope. The AUI/NRAO claims totaled approximately $13 million. After negotiations between the parties failed, COMSAT called for an arbitration by the AAA, as the contract specified. After a lengthy period of discovery, a formal hearing, and study of the record, the arbitrator issued his decision. The arbitrator ruled that AUI is to pay COMSAT $1.05 million for the costs of the additional wind loads, $3.17 million for the fatigue costs, and $2.40 million for delay costs associated with these items. He dismissed the COMSAT claim for design optimization costs. He ruled that COMSAT is to pay AUI $2.55 million for costs of delay, and dismissed the AUI claim for loss of use. The net result is that AUI is to pay COMSAT $4.07 million within 30 days. "While we do not agree with every aspect of the decision, the limited amount of the award versus the amount originally sought by COMSAT clearly indicates the essential merit of AUI/NRAO's position. What is more important, however, is that this matter is finally resolved and we now can focus our efforts on making this world-class instrument available to the scientific community," said Paul Vanden Bout, NRAO Director. "We understand that after the arbitrator's award COMSAT still will have spent many millions more than the contract amount on this job. The fact that they finished the job is testimony to the integrity, honor, and good faith of the company," he added. The telescope, named the Robert C. Byrd Green Bank Telescope in honor of U.S. Senator Robert C. Byrd of West Virginia at a dedication ceremony on August 25, 2000, now has been outfitted with scientific instrumentation. Its commissioning period, during which tests of performance and calibration of instrumentation are conducted, is well underway. A limited call for First Science observing programs yielded 80 proposals from more than 200 scientists around the world. Eighteen of these have been selected to be scheduled for observing time on the telescope. "The GBT is a powerful new tool for discovery that astronomers look forward to using," said Prof. Joe Taylor of Princeton University, a member of the AUI Board of Trustees whose work on pulsars received the Nobel Prize in 1993.